Teacher Appreciation Week is May 7-11 and if you’re like most parents, you are wondering what to give your child’s teacher this year. 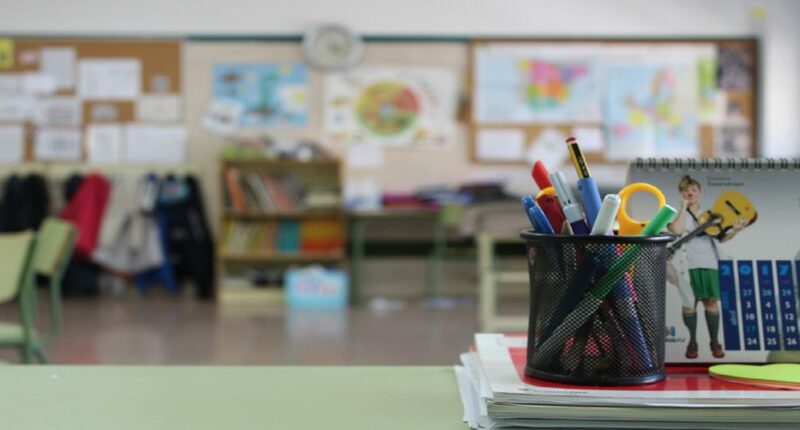 Take it from me, an elementary school teacher for seven years, skip the coffee mug and try one of these fun, inexpensive ideas. And if you really want to earn some extra credit, try all 10! Why not? They’re simple to put together and I’m sure your child’s teacher deserves it. 10. 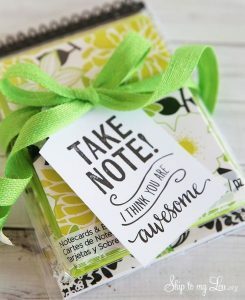 Give a set of notecards (FREE printable). Ironically, teachers thank people all year long, sending notes to parents, students and colleagues. You can download many online for free, buy a set from your local Walmart or Dollar Tree ($1-3) or get fancy and personalize them. 9. Flowers or a potted plant. For a personal “Pinterest” touch, have your child help by painting the pot – maybe in your teacher’s favorite color? Add your child’s handprint or use chalkboard paint for a classroom look. 8. 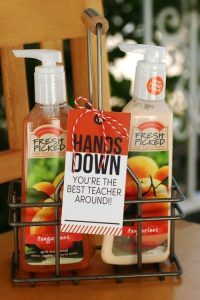 Pair a soap with a hand sanitizer or lotion to use in the classroom or in their own home. Add a personal touch with a special note attached. Use this FREE printable to add a personal touch. 7. Take a silly picture of the whole class. Have the kids sign it, then date and frame it. A wonderful keepsake! 6. Frame a special print. Buy a gallery style frame from Target or Michael’s to frame a simple print or something special. A simple, yet beautiful accent to any classroom. 5. 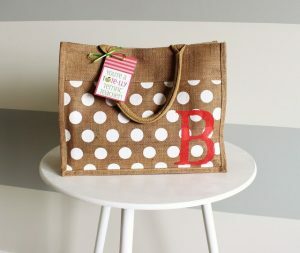 Give an initial tote. It’s personal and useful. Because a teacher can never have too many totes. Attach a personalized tag, fill the bag with goodies or gift it by itself. Voila! A perfect gift. 4. Cookies or sweets. Sweets are always a great gift. Mini sugar cookies or chocolates totally work. Just buy a package of your favorite sweets, put them in a mason jar, slap a personalized sticker label on and you’re good to go. Teachers are constantly eyeing the clock and with so many beautiful, trendy watches out there, you can’t go wrong ($10 or less). The coffee-lover – Starbucks or Dunkin Donuts gift card! Add these FREE printables to make it an A+ gift! 1. A personally, hand-written note or letter. One from you, the parent, and one from your child. Not a text. Not an email. A sincere, handwritten note. Simple, yet meaningful! A priceless gift. I still have several from my previous students. Whichever gift you give, the most important gift is to say, “Thank you! A teacher is not just a teacher; they are counselors, mentors, nurses and disciplinarians. They listen, comfort, encourage, inspire and so much more! Whether you realize it or not, they have impacted your child’s life in a way you never could. Let them know they are appreciated … every day. Especially today. Amanda Storie is a stay-at-home mom/wife and LOVING it! She’s a southern “church girl” with a “keep it real and keep it positive” mentality. She loves to eat, sleep and be merry! She hopes to encourage you and make you laugh, and maybe even help you out through this journey of life together.